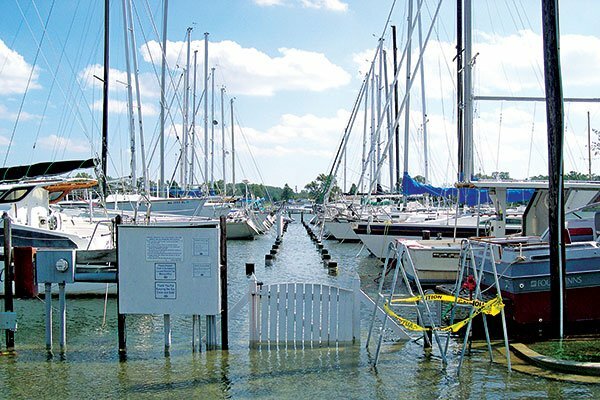 Tropical storms may be unpredictable, but one thing you can predict is that if one hits your marina, your boat is far more likely to survive if you have a preparation plan and follow it. Long-range forecasters have learned that trying to predict the number and intensity of the next season's tropical storms is like herding cats. Weather patterns such as El Niño/La Niña, wind shear, and even Saharan desert dust affect the development of tropical storms, and these intertwined variables can confound the best prognosticators, even as the season is starting. As an example, the 2013 season was predicted to have more than average activity, yet it was (thankfully) a yawn. The 2012 season, on the other hand, had twice as many hurricanes as predicted (including Superstorm Sandy). Tropical storms, it seems, don't care about forecasts, and all it takes is one big storm that comes ashore to make seasonal predictions irrelevant. The lesson: Don't wait for the season's forecast before you develop your tropical-storm preparation plan, which is nothing more than knowing what, where, how, and when. 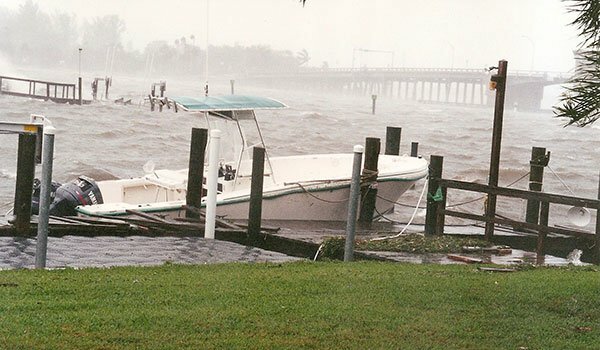 Tropical storms, including hurricanes, produce wind, rain, waves, and surge in proportions rarely experienced by boaters, and storm damage is usually due to a combination of these factors. A good preparation plan has to take all of these elements into consideration and the time to develop one is now, not when a storm is approaching. 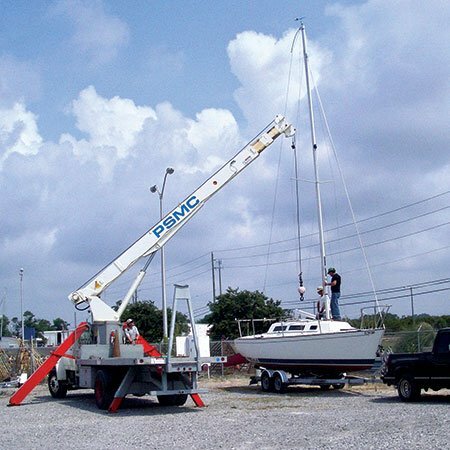 Removing the mast in smaller sailboats greatly reduces windage. By definition, tropical storms have winds of at least 39 mph (which is when storms get a name) while hurricanes start at 74 mph and have been recorded at more than 150 mph. What's not always understood is that as the speed of the wind doubles, its force quadruples. In other words, the damage wind does increases much faster than its speed. This illustrates the importance of reducing your boat's windage — the area your boat presents to the wind — by removing as much rigging, canvas, and deck gear as possible. Whether your boat is stored ashore or stays in its slip, the less stuff the wind is able to push around, the safer your boat will be. Biminis are sure to get shredded in a strong storm, so take off the fabric and the frames. Strip off outriggers, antennas, running rigging, booms, life rings, and dinghies. Remove cowling ventilators and seal the openings. Furled headsails have a surprising amount of windage and are one of the first things damaged by wind, so they must be taken down. Not only can they shake your rig apart when they unfurl (and no matter how well you secure them, in a big storm they probably will), they can cause damage to your neighbor's boat as well. Mainsails are bulky and should be removed also. Rainfall of six to 12 inches in 24 hours is common during a hurricane, and as much as two feet can fall in a day. Cockpit scuppers can be overwhelmed by such torrents, and even boats stored ashore can suffer damage if rainwater overflows into the cabin. Boats stored in the water can be sunk when rainwater backs up in the cockpit and the weight forces deck drains underwater, causing them to backflow. Make certain cockpit drains are free-running. If your boat is staying in the water, remove heavy items from the stern area, such as anchors, extra fuel tanks, and kicker motors, so that the cockpit scuppers are higher above the water. Close all but cockpit drain seacocks and plug the engine's exhaust port. Use masking or duct tape to seal around hatches, ports, and lockers to keep water from getting below. Seal exposed electronics. Make sure the bilge pump and switch work, and that the battery is topped up; shore power is not likely to remain on throughout the storm. Keep in mind that the ability of the pump and battery to remove water is usually greatly overestimated. Small boats should be covered if possible. Tropical storms build up surprisingly large waves quickly, even in relatively small harbors, bays, and lakes. The longer the distance over which the wind can build up waves, the bigger the waves. Waves make boats bounce in their slips, displacing fenders and increasing strain on docklines. Exposure to waves can pound a boat against the dock. Small boats should be trailered inland. Double up on docklines and make sure all are well-protected from chafe. While fenders and fender boards won't compensate for poor docking arrangements, if the boat is well-secured, they may offer some additional protection, especially if they are heavy duty. Smaller boats can be overwhelmed, especially if they are stern-to to the waves. The bow is strongest and least likely to be overcome by water and should face into the waves.